As we move forward our daughters are at a point of beginning their own careers, so they will be with us less often. We will endeavor to continue to supply the most reliable equipment and service in the business. Where do we operate? That is a far reaching answer. We are focused in Southwest Iowa (12 of 15 counties), Eastern Iowa/Southeast SD, Northwest Missouri (hoping to create more regional centers), and Eastern Nebraska. In short we travel the Missouri River Basin. We have the honor of working the National Pedal Pull in Mitchell SD's Corn Palace each year. We are the host of the Missouri State Pedal Pull at the Missouri State Fair in Sedalia MO each year. The home of Kayla Myers 2008 10 year old National Champion and two time third place finisher; and 2010 International 11 year old Runner up and two time third place finisher. Women's winner at the National Pedal Pull twice "15" & "17", while finishing in the top two all 4 years. We are featured at several events through out the Midwest. Missouri State Fair; National Farm Toy Show; Pulls in Metro Omaha; Sioux County Iowa; Westfair in Council Bluffs IA and numerous county fairs throughout our service area. Click on news report from Westfair. Questions often come up. 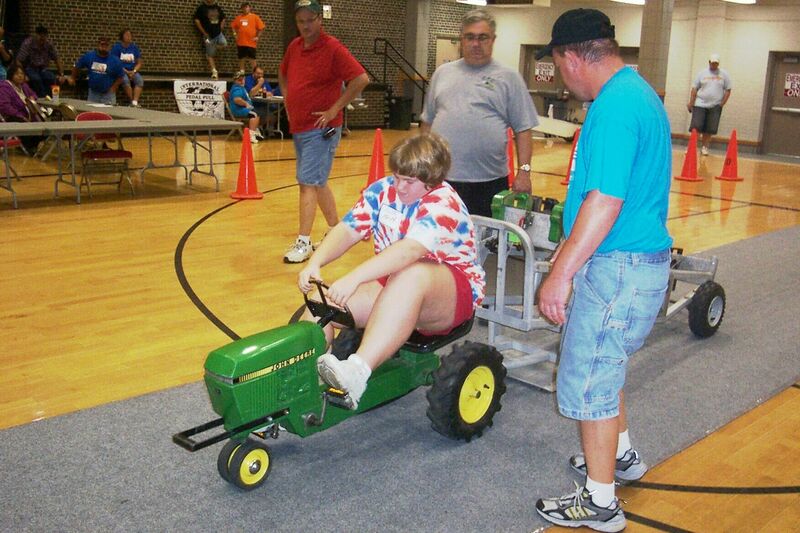 What is a Pedal Tractor Pull? What is Sanctioning? and You can go to a National? Let us say we hope we answer the last question with the page "Path to Nationals"
A Pedal Pull is the greatest character building, healthy, most entertaining, and full of sportsmanship activity for kids. On the floor at Nationals in our second year 2009, Boy have we gotten better since then. Thanks to the support and sponsorships of many outstanding states, counties, communities, companies, and individuals, we have grown beyond any forecast in the beginning. We have limited our number of pulls by keeping the family together, yet now our girls are becoming more and more in demand in numerous fields, so Willo and I or just me will be covering more pulls. Our health requires the help we ask for and must expect. We simply can not do pulls if help requested is not provided. We will be forced to drop pulls not providing as much help as asked for. We ask for 4+ persons per sled and 2 additional if 2 lanes are used. So one sled 4+ helpers, and two sleds 8+ helpers. There should be a plan for one to help at the table in any case, on the chance I am on my own. Thanks. God Bless our Fans for all your prayers!! Cancers nor diabetes will hold us back from helping children and families. Great things happen when you care about children and families more than who is the biggest or makes real money. The Lord has cared for us so we can help his children through this activity. 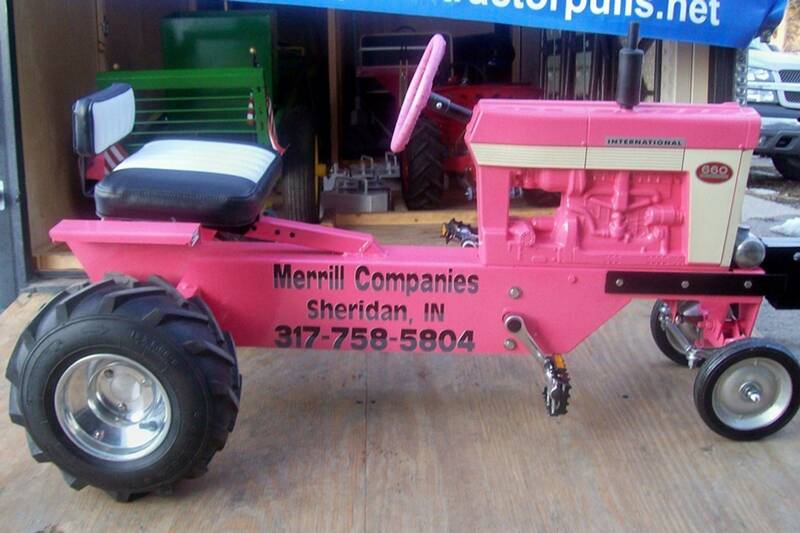 Title picture is original pink tractor that has tour the country. I can hardly wait for someone to say they something about pink being their idea, and just for the record orange is the color of Leukemia. Health care is important, support proper health care for everyone. Until you have $125,000 a year in health cost, for drugs alone, every year and can not buy insurance you don't really understand.